2.1 Davies, "6 Things Wrong with Italy"
4.1 Mazzini's Argument in, "On the Duties of Man"
10.1 Fo, Dario, Accidental Death, Commentary, xxxix-xliv. Name, major, goals, motivation, relevant experiences. Davies, "6 Things Wrong with Italy"
"the economy having contracted for the last six consecutive quarters and languished in more than a decade of almost non-existent growth. Unemployment is at more than 11%; for under-25s, it is more than 36%. Italy has the second highest ratio of sovereign debt to GDP in the EU." Treatment of women: "Italy's female employment rate is, according to the Organisation for Economic Co-operation and Development (OECD), 46.5% – better only than Greece, Mexico and Turkey among advanced economies, and 12 percentage points below the EU average." Justice system: "Italy is one of the most litigious countries in Europe, with more than 2.8m cases brought in 2011 alone, and has by far the most lawyers of any EU country – around 240,000" also, overcrowded prisons. North/South division: "GDP per person is more than 40% lower in the south than in the centre and north "
The seven pre-unitary states - Austria dominates Lombardo Veneto directly; indirect rule over the duchies in central Italy. Garibaldi bravery; progressive political ideas, born in Nice, Annexed to Piedmont. Mazzini's Argument in, "On the Duties of Man"
Competing voices (from revolutionary Europe): improve the material well being of oppressed workers. rights first. material well being cannot be the end of social revolution. Duties to state and family are still egoistic. Need to be informed by God's plan which is universal humanism. More than a summary, actually a list of legitimate state functions, interestingly, including confiscation of Church property! Division of north and south – south mostly peasants. Duty of the proletariat to ensure peasant rights. Reggio Emilia workers were suppressed and supported corporate ideas – Turin communist spoke with them and they reject reformist, corporate position. Sardinia – war veteran’s movement, more solid social structure. 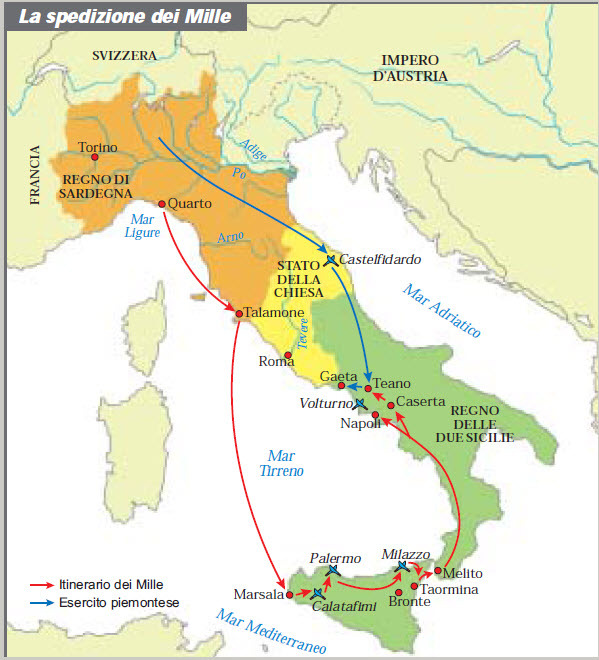 Risorgimento, movements of nationalism, World War I. Mussolini desired to reshape “traditional defects” of Italians. Mussolini believed you had to start from birth and shape the Italians throughout their lives to change “not only somatic features or height, but also character.” This could be accomplished with a strong leader and a revolution. Utopia-esk. Opera Nazionale Balilla (1926) – laboratory experiment that raised children from birth in an environment to be trained as soldiers for life. Different classes of people established. Two classes: those chosen to be part of the new aristocracy and those raised as docile instruments to work for the totalitarian state. “New woman” was a successful wife and mother who bred many citizen soldiers, but could also be cittadina militante – female militant citizen. 2nd half of the 1930s – anti-bourgeois campaign and intensified racism – strengthened the idea of Fascists and anti-Fascists, not compatible with each other. “New Man” was collective and organized, education by totalitarian pedagogy to identify spontaneously with the community and the state. Freed from individualism and supported collectivism. Mussolini saw the Italian people as his antagonist, the church had softened him. Made their change his life goal until the fall of the regime. Military failure in WWII started to drive him crazy – you can’t turn a people that has been an anvil for 16 centuries into a hammer with one revolution. He felt failed by his people. Succeeded for 2 decades and attracted Italians. Fascist intellectuals tried to draft their party plans at a conference in Bologna that resembled that of the German manifesto that was earlier condemned. Trying to combine intellect of science and mathematics with the complications of politics is overstepping the boundaries of one’s talents. Tries to introduce a new faith – very mish-mashed and unorganized. No new ideas. Italy should recognize this disorganization of the regime and become a liberal country not riddled with strife. Writers do not have the same conception of the world as the readers. They cannot relate with the lower class or the culture. Church is not successful either with providing popular culture, and this leaves the people with a lack of lively spiritual life. Oratory is popular. It is not only poetry but in a large part theater. It covers not only the popular past but also the urban and rural instances. American Dream (from rags to riches)with honor as currency "I want me children to be born with more honor than I was born with"
It is the saints job to fulfill his end of the bargain and "listen to his prayers and satisfy his requests"
Escapist, uproarious farce, also hard-hitting political drama – arouse anger over death in custody of an innocent man in 1969 and over a wider crime against democracy committed by the powers that-be in Italy. Operation Gladio – underground organizations who were to focus for resistance in event of some Soviet invasion of western Europe. P2 linked to right-wing terrorism (bombing of Italicus train in 1974). Coup d’etat in 1967 overthrew Greece – viewed by left as establishment of right-wing regimes all around Mediterranean. “strategy of tension” in Italy was use of indiscriminate killing to create social unrest and desire for repressive measures, calling for electorate to reorganize and put a totalitarian “strong man” in charge. 1960s in Europe and N. America time of innovations and overturning of established beliefs in politics, arts, and morals. 2 September, Fiat suspended 25,000 workers. Led to strikes and bombings – policeman killed, possibly by a police car. 12 December 1969 – bomb at Banca dell-Agricoltura in Piazza Fontana in the center of Mialn. 16 killed, 90 injured. Another device found and exploded by police instead of deactivated (suspicious linkage to the police). 3 bombs in Rome same day. Groups of “blacks” (fascists) continued bombings in revenge of the loss of the war in 1945. Police immediately announced anarchists were behind the bombings (Pino Pinelli). He was arrested and subjected to unfair questioning for 72 hours before “falling” (possibly pushed) from his cell window to his death. Valpreda idenitified as the definite mastermind behind the plan and was wrongly accused. Fo, Dario, Accidental Death, Commentary, xxxix-xliv. Pinelli was a nonviolent, family man, believing that common language would lessen risk of conflict. Didn't seem like police lunged for him and took his shoe b/c he had both shoes on after the fall. It was winter so why would a window be open? If the window was closed, why couldn't 6 police prevent the leap? chief said "I swear we did not kill him"
Adriano Sofri, Ovidio Bompressi, and Giorgio Pietrostefani were accused of murdering Calabresi. They were members of Lotta Continua. Many believe those accused of killing Calabresi are innocent. "I know. But I do not have the evidence, even the clues." Calls it Italy's "saving grace"
Harlequin is “a-social” and mocks at the heart of what most people deem important honor, logic, common sense, customs. Fo comes out to introduce his play in which he discusses the background of the play in relation to current events. Franca Rame translates (creates manuscript of the play) – difficult to find central text, where the play is rounded off/completed. Also wrote “can’t pay? Won’t pay!” and “Mum’s Marijuana is Best” to speak to common problems in Italian society. Fo wrote quickly and had play finished by 1970, approved by board (not easy) and then premiere on Dec. 10, 1970. Script altered continuously throughout his trial with new revelations about the situation. Fo set out to make his point by focused humor, irony, satire and the use of the grotesque – why the maniac is the main character. The ending is confusing and does not specify how the maniac falls from the window but does show that the “bound” policemen were really free from their handcuffs all along. Fo believes the system (social democracy) stinks and inquiries by a real judge won’t change anything. Later version shows Maniac finding bomb that Bertozzo was to explode and he is going to start a scandal – won’t fix anything but will put the Italians on the same level as other world power democracies. Maniac doesn’t want to take hat off – Calabresi says he does mind if they close it. Maniac pretends to be the first counsel of the High court, there to find out about the anarchists death. Says he has a twitch when people lie. No proof of bombs being planted by the anarchist but the police insisted there was as a tactic. Railway man must have planted bomb at a railway because bombs at a courthouse must be planted by a judge, etc. – makes no logical sense. They say that the government is at fault for why they would have jumped, because they want them to create social unrest. Maniac says NO, it’s all his fault! There was no evidence of them being in trouble/losing their jobs. He ‘planted the bomb’ so to speak that almost drove them to jump. Revised version – happened at 8 in the evening, not midnight. The depression then, the fall still at midnight. Tells them what they said “this won’t be the death of anarchism” and that they were patting him and comforting him. Constable: Grabbed him anarchist by one foot but shoe came off and he fell ← proof trying to save him. BUT both his shoes were on his feet when he fell. LIES!! Pinelli kicks Valpreda out of the Anarchist club because Vlapreda made it seem like the Anarchists use bombs casually. Rovelli is an anarchist and wants a pub, but Calabresi denies it unless he "whistles." Calabresi wants him as a spy because he thinks the Anarchists are responsible for the bombings. Calabresi comes to see Pinelli and Pinelli is depicted as a family man. Calabresi knows Pinelli kicks Valpreda out which informs Pinelli that they have a rat. Calabresi finds pinelli again and questions him. He seems to think Pinelli is violent and is behind the bombings. Pinelli tries to convince him otherwise in the book store. Pinelli says he is nonviolent. it seems like they are accusing him and want him to sign a paper saying Valpreda did it. Pinelli refuses. The police make a fake story up saying Valpreda confessed to see what Pinelli will say. Pinelli is insistent they are not involved. Calabresi leaves, the police rough him up. they hear a bang. Pinelli and Valpreda argue in the beginning. They do not seem close. Officer Penesa and others are present in the room when Pinelli "jumps"
Political control -- different channels for different. Problems emerged from his monopolized media and his political career. Conflict of interest: 1)Using political power for personal gain 2)Using personal power or political gain "principal instrument for obtaining the results he wants" . Mistrust of government by public from Berlusconi's abuse of power. Reforms, if any, that were made were poor and ineffective. Positive liberty (having control over every decision we make) is a disguise for tyranny. True liberty is negative. The masters of sovereigns are not all the same – some slaves may be able to do as they please, while others are less fortunate. Liberty of citizens involves not being hindered or dominated. Not subjected to arbitrary power of one who can do as he pleases. Italians are not interfered with, but there is the possibility of being oppressed in the current system – man can beat his wife if he chooses, student gets job based off of caprices of their professor, citizens can be thrown in jail at anytime. Cicero – liberty does not consist in having a good master but in having no master at all. No one who has been a business man (Bonar Law, Loucheur) has achieved the same influence as those who were just great politicians (Washington, Lincoln, etc) – people know that their interests are not for the public, but in money-making. "the court is a temple of falsehood, taken in the narrowest sense as a deliberate attempt to conceal the truth"
"the courtier is devoted to pleasing the prince without being in a inept flatterer but rather a modest and reserved adulator"
the prince looks for people who are morally corrupt. thought to have 90 people in parliament who are corrupt. This makes it easy to make laws that are corrupt. "A hundred men acting uniformly in concert will overtake a thousand men who are not in accord"
Negative aspects of a court system include: perverted ideas, encourage ignorance, corrupt morals, promotes greed, etc. Rights must be limited so they can exit for everyone: "What rights would other people ever have, if we did not feel the duty to recognize them, thereby restricting our own liberty with a rule"
Duty shouldn't be/can't be ordered "you must feel that you must"
By performing duties, one establishes a "moral liberty"
All citizens have the duty to be loyal to the Republic. Decisions must not be guided by interests of a political party, friends, etc. Church emphasized family and women’s role in it, political crises 1960s-1970s led to forceful feminist movement in the west. Mazzini thought, in the Risorgimento, that women should be released from ignorance and servitude, but should still play the role of a mother to her family. Women could not own property w/o husband’s consent, had little control over their children legally, and could easily be charged with adultery while men were free to have affairs. Questione femminile: improvement of women’s education and workers rights. Radical, Socialist, and Catholic Feminists all differed on opinions of family and divorce but agreed on improving education, addressing prostitution, regulated working conditions, and maternity leave. Mozzoni believed women should have absorption in modern progressive state through work, education, and divorce. Appealed to bourgeois women to stray from their structured domestic role. Failure to win suffrage in 1912 caused drop in fight for emancipation and lost in the rise of Fascism. Fascism more successful than Risorgimento in that it created a united an powerful nation-state, able to compete on the international stage. Achievements of new feminism: organize on large scale, national nurseries and family-planning, equal pay and maternity leave, equal authority w/in family. •Conflict between those who think that the asymmetry is not translatable into free forms etc. "women are the weak link in masculine virtue"
men must not be feminine and must prove their performance and masculinity must be earned. when men are shamed, they are emasculated. Acid attack: The sulphuric acid commonly used in these attacks burns flesh and bones quickly, causing terrible pain during and after the attack. Results: Eating and drinking become difficult. The victim often loses her sight, even if only in one eye, and often feels marginalized by society and psychologically fragile. There are at least 1,500 acid attacks every year, not to mention all the cases that are not reported. In 80% of the reported cases the victim is female; 40% are under the age of 18. It’s a phenomenon that, although still marginal in Europe, is increasing in countries such as Greece and Britain. This page was last modified on 25 June 2014, at 02:22. This page has been accessed 89,265 times.